TAIPEI (CNA) -- Taiwan's Tai Tzu-ying (戴資穎) easily dispatched old foe Saina Nehwal of India at the Indonesia Masters on Sunday to secure her first women's singles badminton title of the young season. The world No. 1, who had an 8-5 career mark against Nehwal and had won their last six encounters dating back to 2014, was in control throughout the match and overwhelmed her Indian opponent 21-9, 21-13 in just 27 minutes. A day earlier after reaching Sunday's final with a difficult 21-19, 21-19 over recent Tai nemesis Ratchanok Intanon of Thailand, Nehwal had high hopes that her form and fitness had finally returned after a 2017 marred by injuries. "I have the confidence, because I have beaten these players before. But the touch was missing. I was not able to cross the rounds because my fitness was not up to the mark. But in this tournament, I can see that my fitness is good. I'm able to hit well, move well," the former world No. 1 and 2012 Olympic bronze medalist said. "Hopefully, (tomorrow) will be like a dream come true." But Tai made sure to put that dream on hold, jumping out to a 10-2 lead in the first game and a 9-3 lead in the second game to leave no doubt about the outcome. 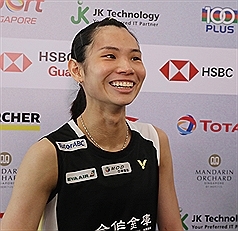 The 23-year-old Taiwanese, known for keeping opponents off-balance with shots that are hard to read, reached the finals of her first tournament of the year, last week's Malaysia Masters, but fell to Intanon 21-16, 14-21, 24-22. She is hoping to build on an incredible 2017, when she solidified her world No. 1 ranking by winning the All England Open, Malaysia Open, Singapore Open, and Badminton Asia Championships in succession early in the year and later captured the French Open and Hong Kong Open. Tai was the only Taiwanese who reached a final at the BWF World Tour Super 500 event being held in Jakarta. Taiwan's Chou Tien-chen reached the semifinals of the men's singles on Saturday before falling to Anthony Ginting of Indonesia.